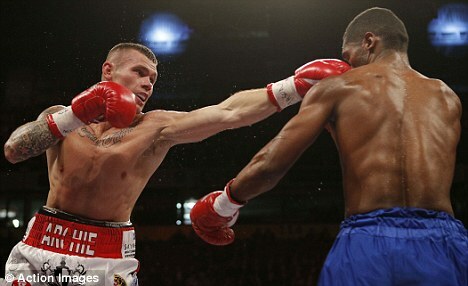 Martin Murray warmed up for a potential world title fight with Sergio Martinez in April by stopping previously unbeaten Jorge Navarro inside six rounds in Manchester. The St Helens middleweight won the vacant interim WBA strap in the process but it is WBC champion Martinez he will now set his sights on, most likely after another warm-up bout after Christmas. Murray, 30, has endured a frustrating year, fighting just once against unheralded Frenchman Karim Achour in June after drawing with then world champion Felix Sturm last December. Against Navarro, he was content to let the Venezuelan control the centre of the ring in the opening road as he attempted to gauge the power of a man who had stopped 10 of his previous 12 opponents. But in the final stages of the round, Murray dropped his younger opponent to the canvas with a solid right although Navarro beat the count. The home fighter worked well behind the jab in the second round, continuing to take his time looking for openings and he continued to go through the motions in the next session, doing enough to impress the judges but without taking unnecessary risks. By rounds four and five, Murray had evidently decided he had Navarro's number and that he wasn't going to be hurt by the visitor. He began to pepper his opponent's face with left-right combinations and the marking around the eyes of Navarro darkened. When he let his hands go, Murray looked impressive and such a flurry was enough to floor Navarro for a second time in the sixth round. Although he rose to beat the count, he was immediately set upon again and his corner threw in the towel.